What do you do to look and feel cool? I bake. Baking liberate me from stress, it also helps in regulating my blood circulation, and all the kneading does that. 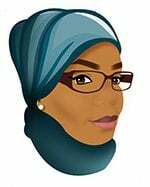 You don’t want to see me when I’m stressed, I just don’t look like me, hence, I bake! 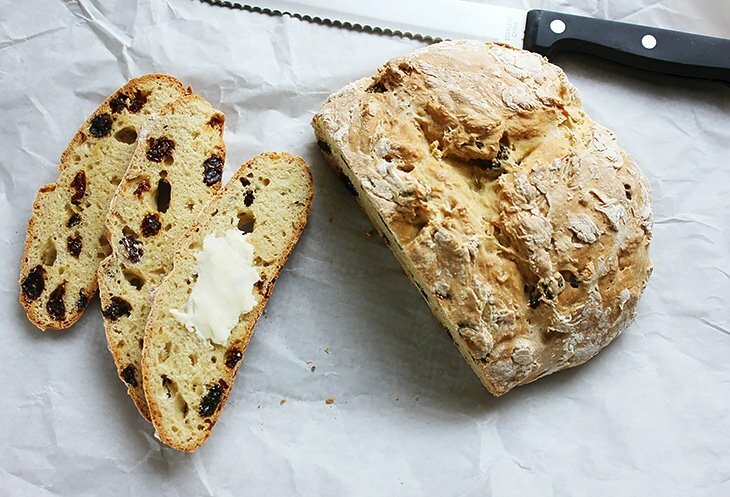 The recipe I’m sharing today is for Traditional Irish Soda Bread, this soda bread requires few seconds of kneading but the taste brings more than just an inner peace. You have to keep few things in mind when baking Traditional Irish Soda Bread. Extra kneading will result in tough and dry bread, so keep the kneading to few seconds, and you will have a light and moist texture from the inside. 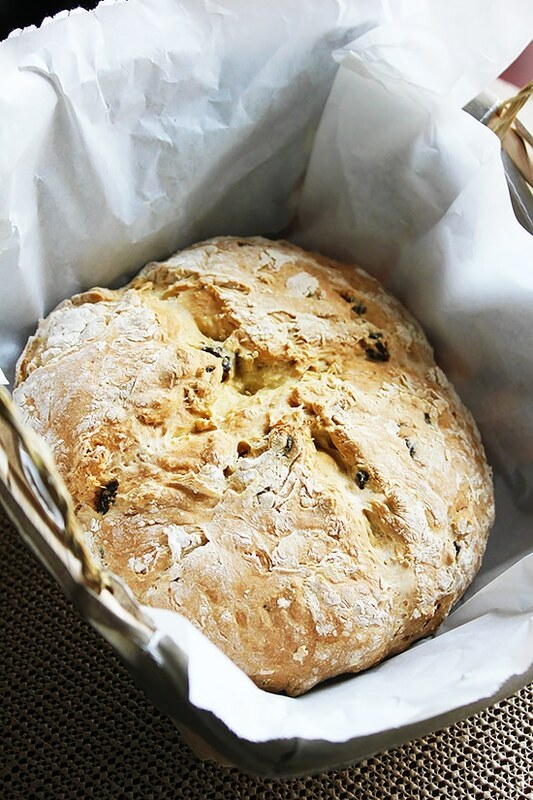 While baking Irish Soda Bread, you have to remember that the bread might be done baking, but won’t have that golden dark color you are looking for, the oven you used and its temperature can be the reason. The best way to know if the bread is ready, simply insert a thin skewer in the middle of the bread, it should come out clean. Do not over bake Irish Soda Bread. 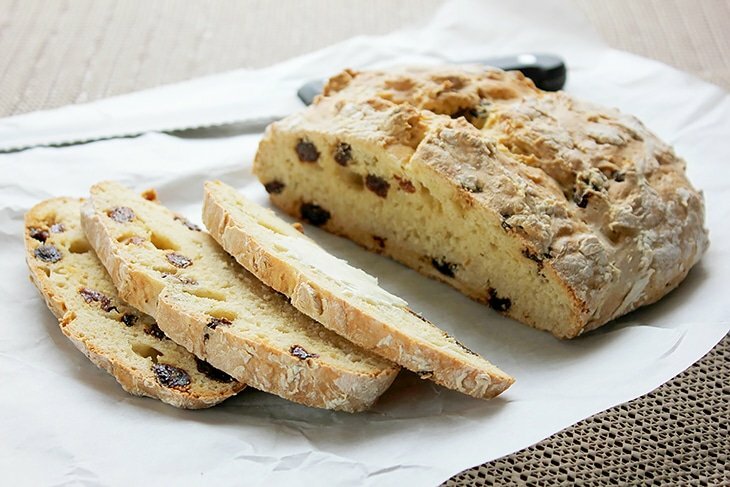 Usually, Traditional Irish Soda Bread is served with butter or jam on the side, and the best time to have it is when it’s just out of the oven. 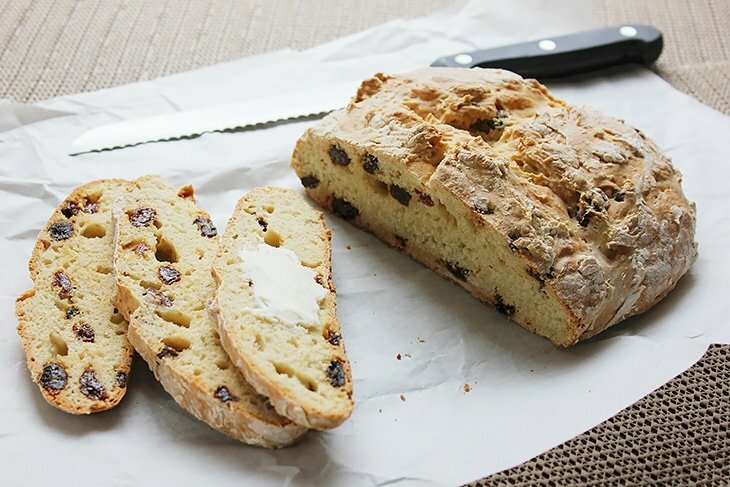 Irish soda bread with raisins brings a balanced sweet flavor, buttermilk is another star and it contributes in creating the moist texture of this Irish soda bread. I have to mention that this soda bread has a crunchy crust if you prefer a softer crust all you have to do is cover Irish soda bread with a towel for few minutes while still hot. 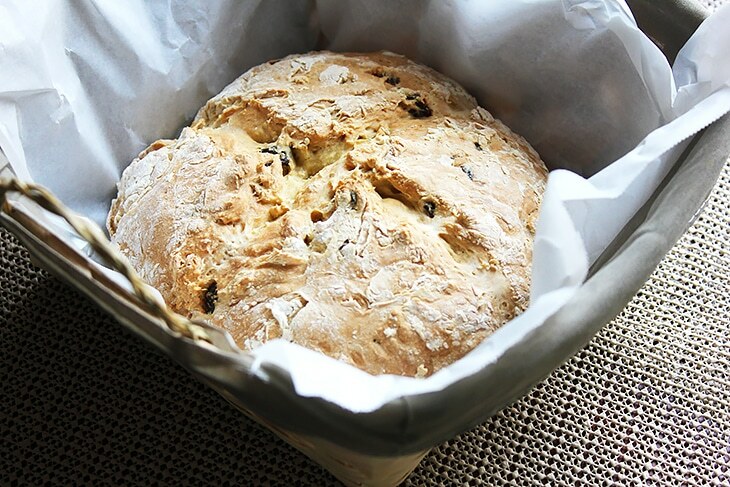 There is another recipe for Irish Soda Bread on my blog and it has egg in it. Traditional Irish Soda Bread has a crunchy crust from the outside, but the buttermilk gives it a moist and light texture from the inside. Preheat oven to 400F/200C. Line the baking sheet with parchment paper. In a bowl, add all the dry ingredients and mix well. Add the raisins. 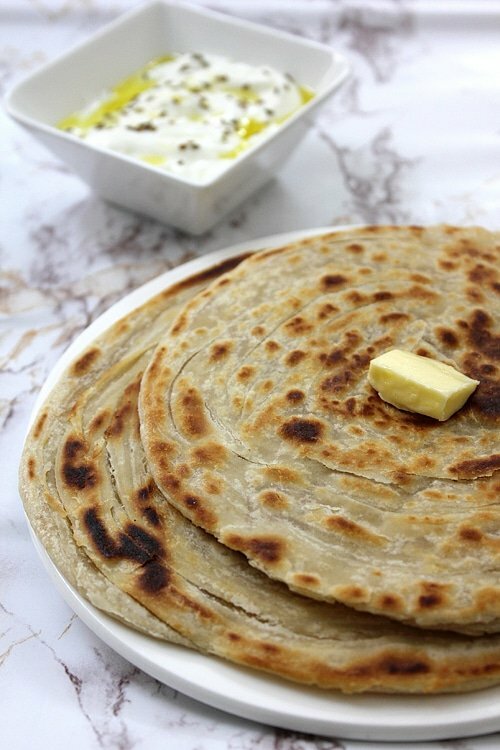 Gradually add the buttermilk until the dough comes together. You will have a sticky dough. 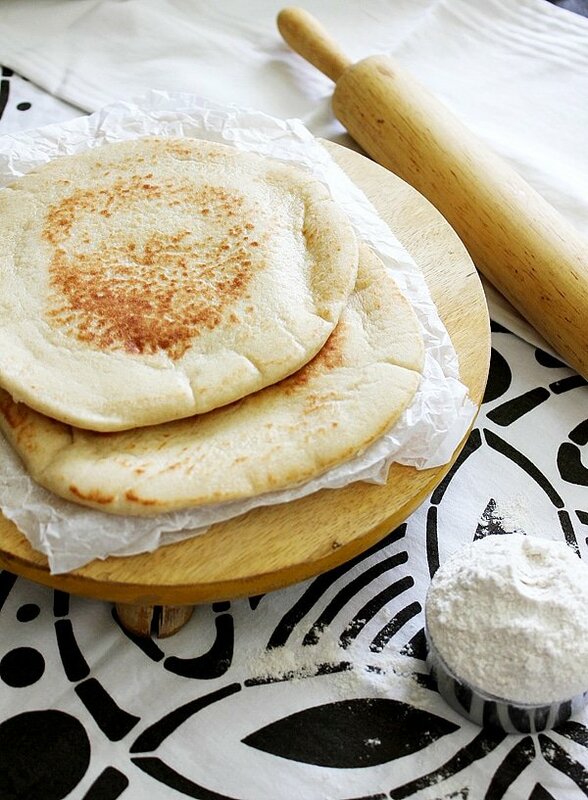 Generously dust your hands with flour and shape the dough into a ball. Place on baking sheet. Press the dough down to 2.5”. Dust a sharp serrated knife, score the dough an inch deep creating an (X) or a (+) shape. Bake the bread for 35 to 40 minutes. Serve Hot with butter or jam. 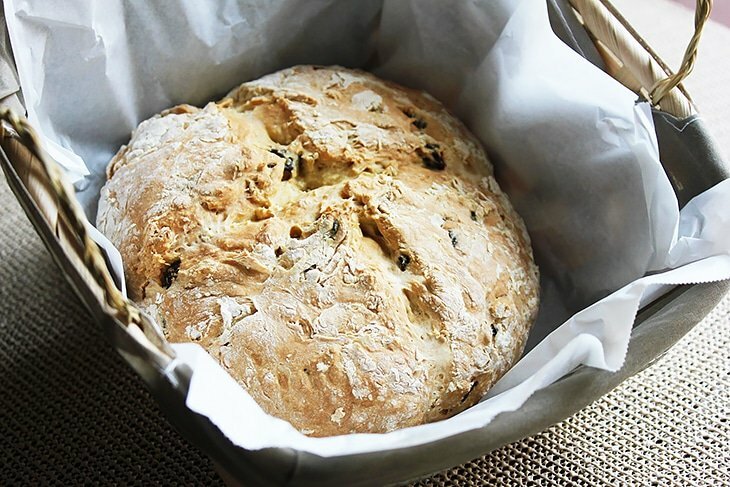 Your irish soda bread looks great! And thanks for the advice to make sure we don’t overdo it. I’ll be trying this soon. One of my favourite quick bread, Muna. Yours turned out really great. This bread looks so good. I just want to break MA chunk off and slather it in butter. Oh my gosh, I so want to dive into that bread. It looks so moist and delicious. I love the addition of raisins! This looks like a delicious recipe to try to make. I want to eat it right up! 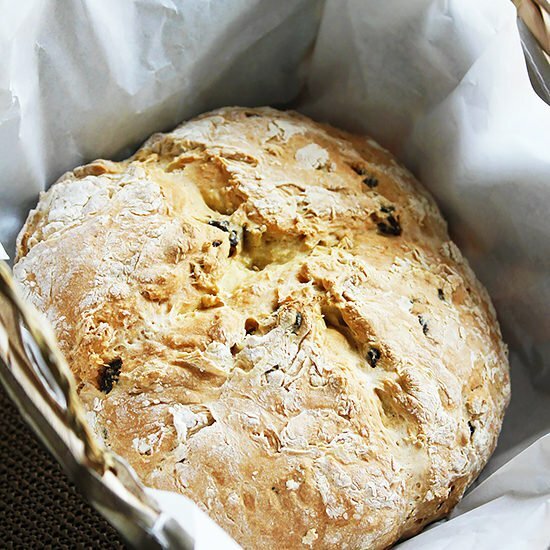 This looks super yummy, I have never had Irish Soda Bread which is funny since I have strong Irish blood. Going to try to make this! This looks delicious! A woman I work with brings this in every once in a while, I would love to try to make this myself. It is so easy to make and I’m sure you’ll love it! My mouth is watering…literally watering. I have never heard of this bread, but am a huge fan of any type of bread. Thanks for the recipe. Thank you Shauna you are so sweet! Looks good. I have never made anything like this. I’m going to need to give it a try. One of my favorite breads. Beautifully done as always, and the recipe is perfect!!! YUMM!